Waiting Windows XP to shutdown sometimes can make us boring because Windows sometimes takes a very long time just to shutdown the system. Even when you used a high-spec PC, the shutdown process still takes a lot of time. Well, there’s a tips to make your Windows XP system shutdown a lot faster than ever. 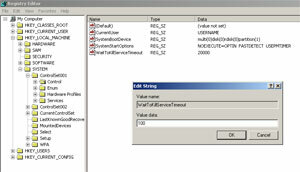 First, open the registry editor using Start | Run, then type “regedit” (without the quotes). After that, go to “HKEY_LOCALMACHINE | System | ControlSet001 | Control”. You’ll see some entry in the right tab, now find “WaitToKillServiceTimeOut” entry. The default value for that entry is “20000″, now we are going to change it to “100″. Double click on that entry, an type “100″ (without quotes”) on the “Value Data” column. Close the registry editor and restart you PC, you’ll feel the effect after the PC restarts.